Let's face it. We're on the go a lot these days, and sometimes precious moments spent with your children are in the car, at the grocery store, or sitting at a ball field. Thankfully life doesn't keep us at home, but instead challenges us to get out there and experience things. Recently I found myself for the first time taking my son to a doctor's appointment with me. Oh he's been to plenty of his own, but this was my appointment. We are lucky enough to have a lot of loving grandparents around that are itching for a chance to watch him, so I usually go solo to see my doctors. I knew it would be an "experience" if I didn't think ahead. Last week I noticed some great flashcards in the $1 section of our local Target. 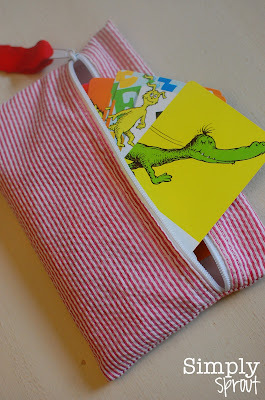 My favorites were a Dr. Seuss counting card game, Dr. Seuss alphabet cards (that have corresponding pictures and words to our favorite Dr. Seuss ABC book), and beautiful animal cards. Because my almost two year old isn't in to playing card games quite yet, I hole punched the set and strung a ribbon through it. That way it gives us counting cards on the go. Also, on the go are some color cards. Notice that they are just some paint cards from the hardware store. I labeled the colors (orange and not apricot light...way to confusing!) and tied them together. There are a variety of learning activities that you could do with cards like these. The animal cards with their facts on the back could be used for classifying. Have children sort by color of animal, size, mammals, habitat, etc. The abc cards could be used to construct funny stories with the words listed. 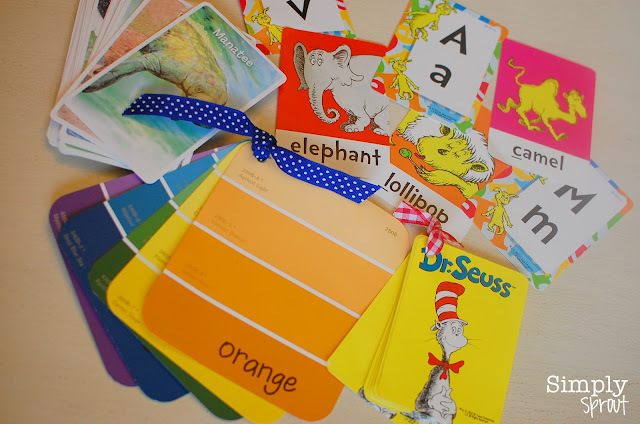 Have older children use the paint cards to write a short story using juicy adjectives (The apricot colored sky filled our home with a warm glow.). I even had my five year old niece while waiting for church to start doing simple multiplication and division with the pictures on the number cards. Make the most of your time together, even if it is waiting to see the doctor. 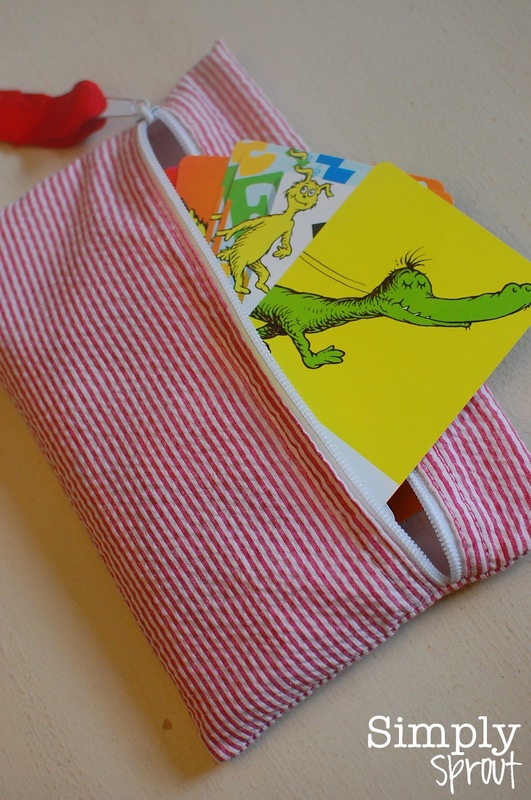 Tuck sets of cards like these in a zipper pouch and keep them in your purse or car. That way you're prepared when traffic strikes, the restaurant wait is too long, or just when hanging out! By the way, we survived the doctor's appointment. He was a champ and flirted it up with all the nurses! Wow! I recently found your store and blog through Teachers Notebook, and I love it! I am a fellow teacher, teacher blogger, and brand new mom! I'm starting back to school for the first time since my maternity leave TOMORROW! Your blog is exactly perfect! I absolutely LOVE how you focus on both being a teacher and a "teacher mama!" Thanks for all the wonderful ideas!